May we take this opportunity to introduce to you to a superb 50’s Rock ‘n’ Roll band, Rock Back the Clock. Originally it was a seven piece band, consisting of bass, lead and rhythm guitars, drums, piano and 2 female vocalists. The late Neil Hiley gave his approval for the band to use the name Rock Back the Clock as this was the name of the weekly radio show that he hosted for BBC GMR in Manchester. After a short time we had our first change. We needed to find a new lead guitarist and this brought in Nigsy (ex Flying Saucers). 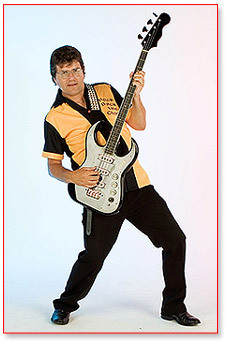 With his driving style of playing, we started the band on the Rock ‘n’ Roll circuit. At this time we backed Linda Gail Lewis and Rockabilly man himself Rip Masters on several occasions. After one of our female vocalists left due to work commitments and to spend more time with her family, the band then became a six piece. We later needed another lead guitarist and concentrated only on Rock ‘n’ Roll venues changing the sets further to accommodate a new jive audience. This eventually lead to our biggest change, the two guitarists wanted to leave as travelling around the country wasn’t what they wanted to do. We replaced both with one guitarist, therefore becoming a five piece band. This is the format that Rock Back the Clock have to this day and has proved to be the most popular line up we have ever had. 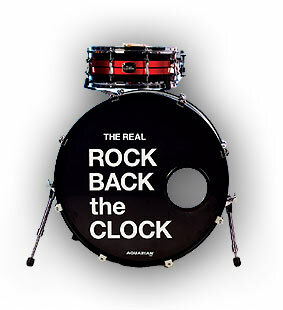 Rock Back the Clock are able to play a wide range of styles that will entertain any audience. Jive, Stroll, Boogie Woogie and a touch of Rockabilly, there is something for everyone. Songs from the current set include tunes such as Rockin’ my life away / Never can tell / Ole Black Joe / Twenty One / Shake it mother for ya / Tears on my pillow / Freight train Boogie / 55 Ford / Say Mama / Two-timing lover / I know why / Dance girl dance / Matchbox plus many more of your favourite hits of the Rock ‘n’ Roll era. Rock Back the Clock are a very popular band on the Rock ‘n’ Roll circuit and have had many good reviews in national Rock ‘n’ Roll magazines. We have invested in new amplifiers and speakers to give the best quality sound. We have also bought the latest in ear monitoring system which removes feedback, extra wires and speakers from the stage. This clears the stage and lets us move around freely which gives the band an extra dimension both visually and vocally. Rock Back the Clock are here to rock back the years and bring back those happy memories of coffee bars, juke boxes, crepes and drapes. We feature all the truly memorable hits from the 50’s and also popular songs from some of the new bands that keep you on your feet, dancing the whole night through. Have you still got the energy ? Yes, long live Rock ‘n’ Roll and you can be assured of an evening to remember with Rock Back the Clock. This band must not be missed! It is with great sadness Rock Back the Clock has to announce that Malcolm Smart our Bass Guitarist died at his home on the 2nd of August. Malcolm had been with us for 16 months and loved being part of a fantastic thing we call music. He was a very committed and talented bass player and was always listening out for new artists and material that would make us stand out amongst all the other bands in the country. He will be sadly missed by us all. Although it will be hard to replace Malcolm, we will continue, as we're sure this is what he would have wanted.